Like all Aerial Arts, there is an element of discomfort involved in BungeeFitⓇ. However, we have tried to minimise this as much as possible by providing you with top of the range, custom-made harnesses. Unlike some schools that use cheaper climbing harnesses, our equipment is specifically designed for BungeeFitⓇ and thus provides support and padding in all the right places. We also highly recommend that you bring a good quality pair of cycling shorts with you, to provide extra padding for the groin area. We do have cycling shorts you can borrow, as part of the equipment setup, but most people prefer to bring their own. We recommend you wear leggings, with cycling shorts over the top (superhero style!). This is not a fashion statement, but it will provide the greatest comfort from your nether regions. You can wear jogging bottoms, but you may get quite hot, especially in the summer months, as BungeeFit® incorporates a cardio element as well as a toning one. We recommend you bring your own cycling shorts, but do have some at the studio that you can borrow. These are washed weekly and in the interests of hygiene, we ask that you wear them over the top of your clothing. Some people find that borrowing shorts is a good plan for their first session, to try out the sport, and then when they realise how awesome BungeeFitⓇ is, invest in their own pair for future classes. You can book through the booking page of the website. Booking is essential as classes are number limited. There is a 48 hour cancellation period for a full refund. Cancellations with less than 48 hours notice but more than 24 hours notice will receive a 50% refund. Due to the high demand for spaces, we are unable to refund classes cancelled with less than 24 hours notice. If a class is full, you can add yourself to the waiting list on the booking page and you will be emailed if a space becomes available. No! 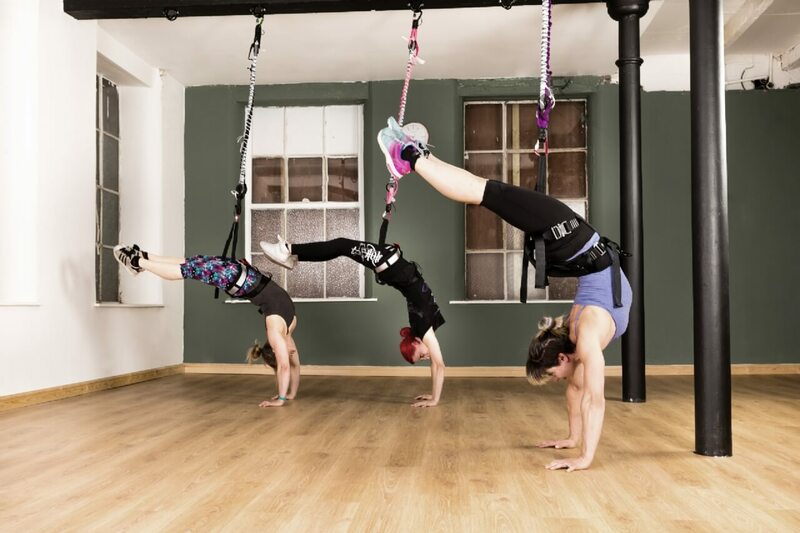 The introductory BungeeFit® classes are designed to accommodate all levels of fitness and ability. We are an inclusive fitness community, encouraging everyone to work to their own level and all moves can be adapted to suit. No, we have bungees to fit a wide range of weights. However, to insure your safety, all participants must provide an accurate weight during booking. There will also be a discrete set of scales available in the studio for you to use if necessary. Your weight will not be shared with anyone else, but will be used to insure your bungee is tailored for you. 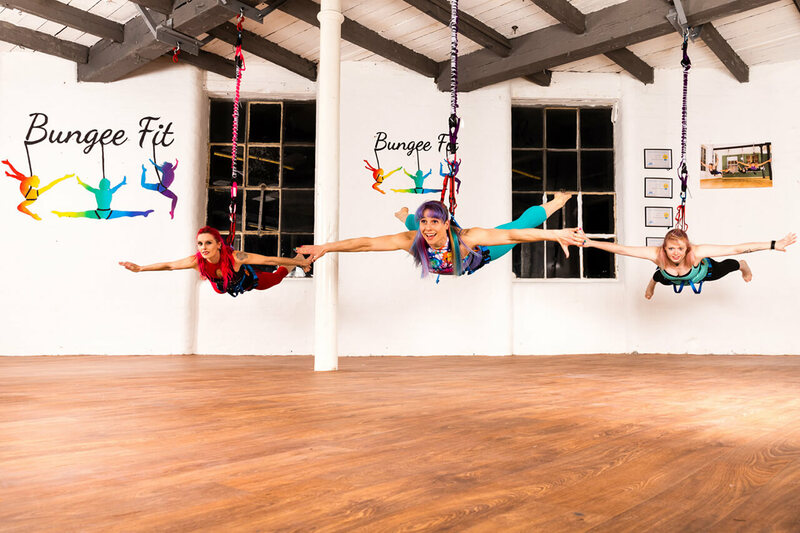 No, you do not need to have any bungee or aerial experience prior to trying BungeeFit®. Our classes are designed to cater for all! 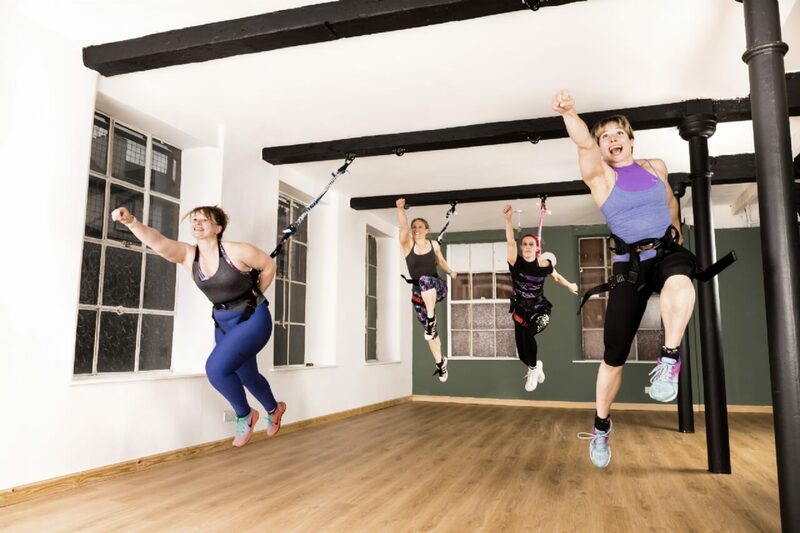 After getting acquainted with the beginners BungeeFit® classes (we recommend 6 weeks to three months), we do have Improvers sessions that are more intense. 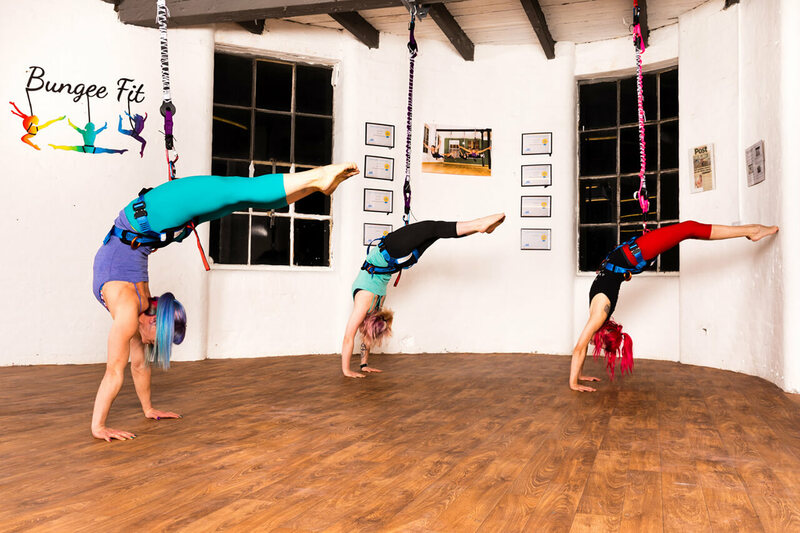 We also have Acro BungeeFit® which involves having two bungees attached to your harness and allows you to learn to do more aerial based moves such as somersaults. 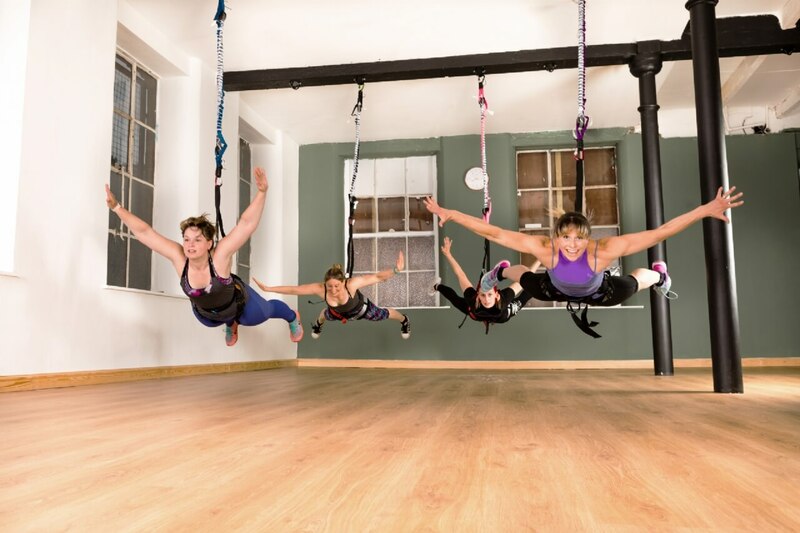 To take part in Acro BungeeFit® we do require you to have some experience in the beginners classes already, to acquire a base knowledge of how to control the bungees. Previous gymnastic/aerial experience will be helpful but not mandatory. How do I find the studio? Any bus that stops at the Victoria Shopping Centre. It's just an 8-10 minute walk up Huntingdon Street. Alternatively, any bus that stops on Huntington Street. The closest Tram stop is probably NTU, with a 10-13 minute walk to the studio. Alternatively, The High School tram stop is also an option, with a couple minutes extra walking, but downhill rather than up. Do you do memberships or class discounts? We use state of the art equipment, including top of the range bungees and custom made harnesses, both specifically designed for BungeeFit®. This means that the equipment is as safe as it could possibly be and also as comfortable as it can be. 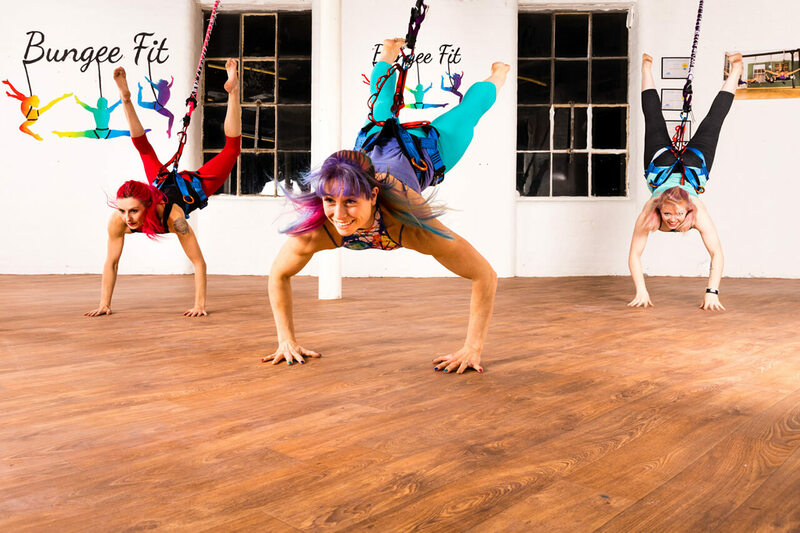 Like all Aerial Arts, there is an element of discomfort involved in BungeeFit®. However, unlike some schools that use cheaper climbing harnesses, our equipment is specifically designed for BungeeFit® and thus provides support and padding in all the right places. We also highly recommend that you bring a good quality pair of cycling shorts with you, to provide extra padding for the groin area. We do have cycling shorts you can borrow, as part of the equipment setup, but most people prefer to bring their own.